Want a free cup of Moe’s Famous Queso? Of course you do. Swing by Moe’s anytime on Thursday, September 19th. To celebrate Free Queso Day, Moe's is asking their fans what makes them famous. Are you a professional cup stacker? How about a Slam Poet? 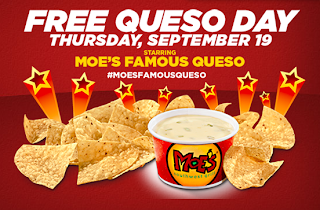 Whatever it may be, share it with Moe's by using #moesfamousqueso! The most original entries could be featured on their queso cups in all of the 500+ restaurants across the country!